There is a concept in chemistry known as activation energy. Activation energy is the minimum amount of energy that must be available for a chemical reaction to occur. Let’s say you are holding a match and that you gently touch it to the striking strip on the side of the match box. Nothing will happen because the energy needed to activate a chemical reaction and spark a fire is not present. However, if you strike the match against the strip with some force, then you create the friction and heat required to light the match on fire. The energy you added by striking the match was enough to reach the activation energy threshold and start the reaction. It’s sort of like rolling a boulder up a hill. You have to add some extra energy to the equation to push the boulder to the top. Once you’ve reached the peak, however, the boulder will roll the rest of the way by itself. Similarly, chemical reactions require additional energy to get started and then proceed the rest of the way. Alright, so activation energy is involved in chemical reactions all around us, but how is this useful and practical for our everyday lives? 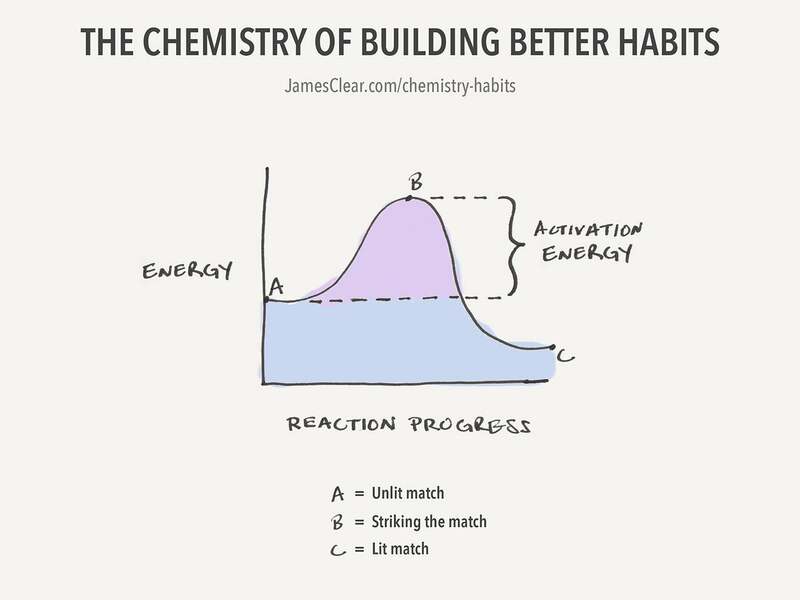 Similar to how every chemical reaction has an activation energy, we can think of every habit or behavior as having an activation energy as well. This is just a metaphor of course, but no matter what habit you are trying to build there is a certain amount of effort required to start the habit. In chemistry, the more difficult it is for a chemical reaction to occur, the bigger the activation energy. For habits, it’s the same story. The more difficult or complex a behavior, the higher the activation energy required to start it. For example, sticking to the habit of doing 1 pushup per day requires very little energy to get started. Meanwhile, doing 100 pushups per day is a habit with a much higher activation energy. It’s going to take more motivation, energy, and grit to start complex habits day after day. It can be really easy to get motivated and hyped up about a big goal that you want to achieve. This big goal leads you to think that you need to revitalize and change your life with a new set of ambitious habits. In short, you get stuck dreaming about life-changing outcomes rather than making lifestyle improvements. The problem is that big goals often require big activation energies. In the beginning you might be able to find the energy to get started each day because you’re motivated and excited about your new goal, but pretty soon (often within a few weeks) that motivation starts to fade and suddenly you’re lacking the energy you need to activate your habit each day. 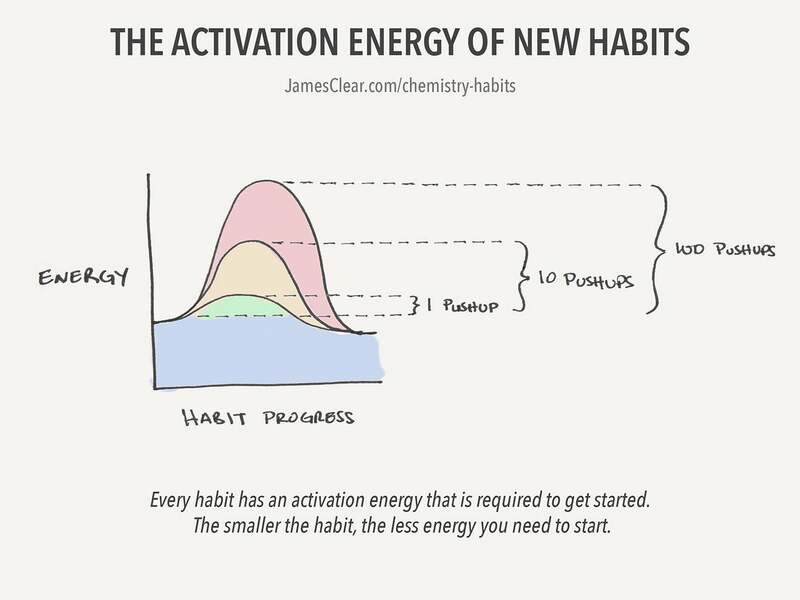 This is lesson one: Smaller habits require smaller activation energies and that makes them more sustainable. The bigger the activation energy is for your habit, the more difficult it will be to remain consistent over the long-run. When you require a lot of energy to get started there are bound to be days when starting never happens. Everyone is on the lookout for tactics and hacks that can make success easier. Chemists are no different. When it comes to dealing with chemical reactions, the one trick chemists have up their sleeves is to use what is known as a catalyst. A catalyst is a substance that speeds up a chemical reaction. 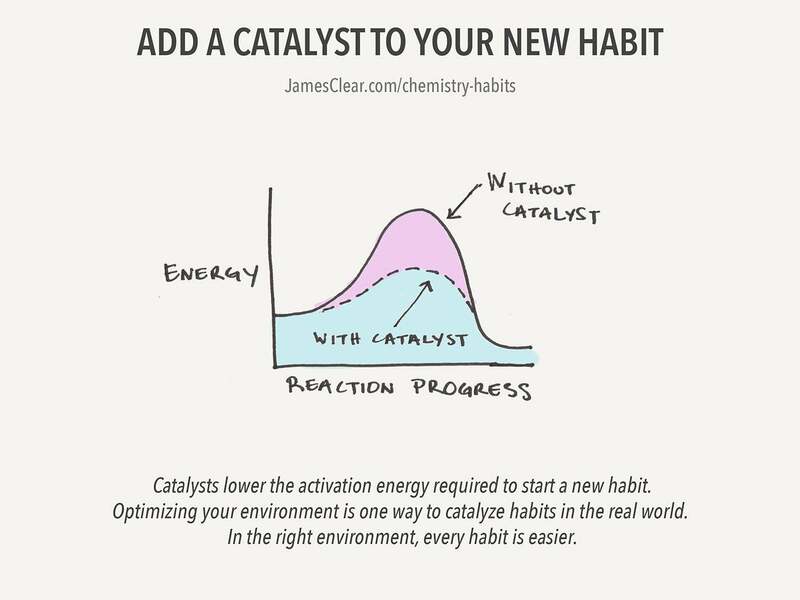 Basically, a catalyst lowers the activation energy and makes it easier for a reaction to occur. The catalyst is not consumed by the reaction itself. It’s just there to make the reaction happen faster. The most powerful catalyst for building new habits is environment design (what some researchers call choice architecture). The idea is simple: the environments where we live and work influence our behaviors, so how can we structure those environments to make the good habits more likely and the bad habits more difficult? Imagine you are trying to build the habit of writing for 15 minutes each evening after work. A noisy environment with loud roommates, rambunctious children, or constant television noise in the background will require a high activation energy to stick with your habit. With so many distractions, it’s likely that you’ll fall off track with your writing habit at some point. Meanwhile, if you stepped into a quiet writing environment—like a desk at the local library—your surroundings suddenly become a catalyst for your behavior and make it easier for the habit to proceed. Your environment can catalyze your habits in big and small ways. If you set your running shoes and workout clothes out the night before, you just lowered the activation energy required to go running the next morning. If you hire a meal service to deliver low calorie meals to your door each week, you significantly lowered the activation energy required to lose weight. If you unplug your television and hide it in the closet, you just lowered the activation energy required to watch less tv. This is lesson two: The right environment is like a catalyst for your habits and it lowers the activation energy required to start a good habit. Chemical reactions often have a reaction intermediate, which is like an in-between step that occurs before you can get to the final product. So, rather than going straight from A to B, you go from A to X to B. An intermediate step needs to occur before we go from starting to finishing. There are all sorts of intermediate steps with habits as well. Say you want to build the habit of working out. Well, this could involve intermediate steps like paying a gym membership, packing your gym bag in the morning, driving to the gym after work, exercising in front of other people, and so on. Each intermediate step has its own activation energy. When you’re struggling to stick with a new habit it can be important to examine each link in the chain and figure out which one is your sticking point. Put another way, which step has the activation energy that prevents the habit from happening? Some intermediate steps might be easy for you. To continue our fitness example from above, you might not care about paying for a gym membership or packing your gym bag in the morning. However, you may find that driving to the gym after work is frustrating because you end up hitting more rush hour traffic. Or you may discover that you don’t enjoy working out in public with strangers. Developing solutions that remove the intermediate steps and lower the overall activation energy required to perform your habit can increase your consistency in the long-run. For example, perhaps going to the gym in the morning would allow you to avoid rush hour traffic. Or maybe starting a home workout routine would be best since you could skip the traffic and avoid exercising in public. Without these two barriers, the two intermediate steps that were causing friction with your habit, it will be much easier to follow through. This is the lesson three: Examine your habits closely and see if you can eliminate the intermediate steps with the highest activation energy (i.e. the biggest sticking points).